Are you looking for some practical tips and tools to help with your social media marketing? 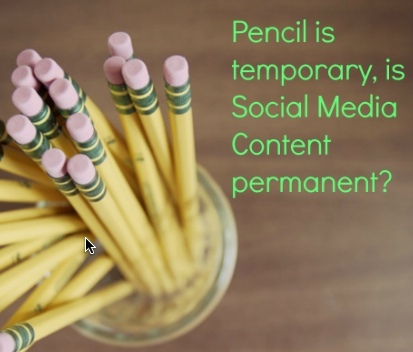 Do you find it difficult to keep up with how quickly social media is evolving? In this article, I outline a collection of technology tools and tips you’ll want to consider using to improve your presence across social media. It takes a lot of time to create quality content, engage on social profiles and sustain online relationships that support your business goals. Larger businesses and corporations often have teams of people dedicated solely to these tasks. For smaller businesses that don’t have the luxury of staff or financial resources, there are tools to help. But there are also efficient shortcuts and tips to help you get more out these technology tools. By using some of these tips to strategically choose your tools, you can get more out of your social media marketing. The more you know about your website visitors, the more you cater to their needs with content, layout and design. In the image below you see the time people spent on your site, how they found your site, the previous site they were on and the country they are browsing from. 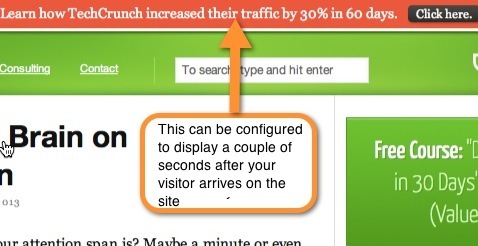 Lucky Orange provides great information about your visitors. Start by recording sessions of individual users browsing your blog and see where they’re scrolling and what they click on. Then interact with visitors while they’re on the site and ask them questions about their experience on your website or the content they’re browsing. Use what you learn to fine-tune your site. The load time of your page is one of many factors that Google uses to determine your web ranking, so it’s important to reduce the size of your images where possible. You upload the images, reduce them and then download a version that’s smaller in size but not in quality. Upload your images and reduce them in size. 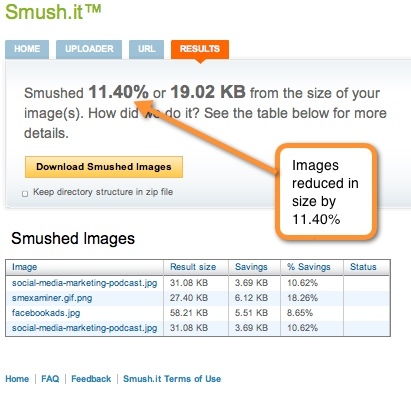 Use these smaller images to improve your social media marketing performance. When I browse a website or blog from Ireland that’s hosted in the United States, it’s likely to run slower for me than for someone who’s browsing from within the United States. To standardize your load times, use a hosting provider that uses a content distribution network (CDN). A CDN keeps the latest copy of your website on various servers around the world so visitors get your content from the server that’s nearest to them, which results in faster load times. To get an account that matches your company name on Twitter, Facebook, etc., you need to visit each social network and go through the whole registration process to discover if your name is available. KnowEm searches over 550 social networks in an instant to see if your name is available. 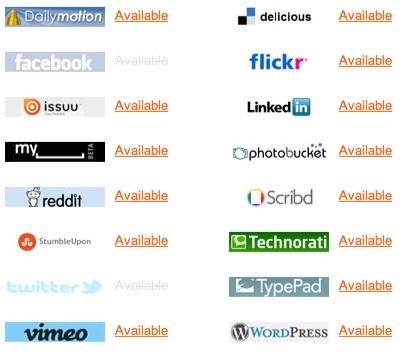 Search through over 550 social networks to find out if your name is available. You may not have time to register your name with all social networks, but you should certainly consider registering it with the most popular ones—even if you don’t plan on using them immediately. Analyze the type of content your competitor sends and how it performs. Model content that gets shared a lot into your own distribution. Find out whom your competitor interacts with the most. These may be people you should be interacting with. Find out what hashtags your competitor uses quite frequently to give you an idea of the category of content they’re sharing. 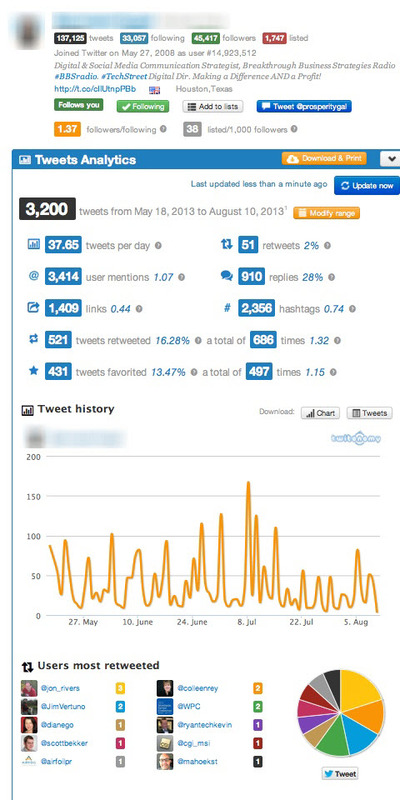 Twitonomy provides useful details if you want to analyze a competitor’s Twitter account. To encourage people to tweet content within your posts, consider usingClickToTweet. Paste your text and/or link into the box provided and click Generate Link. Add this link to your site. If visitors click on this link, a tweet is created with the original text already pre-populated. 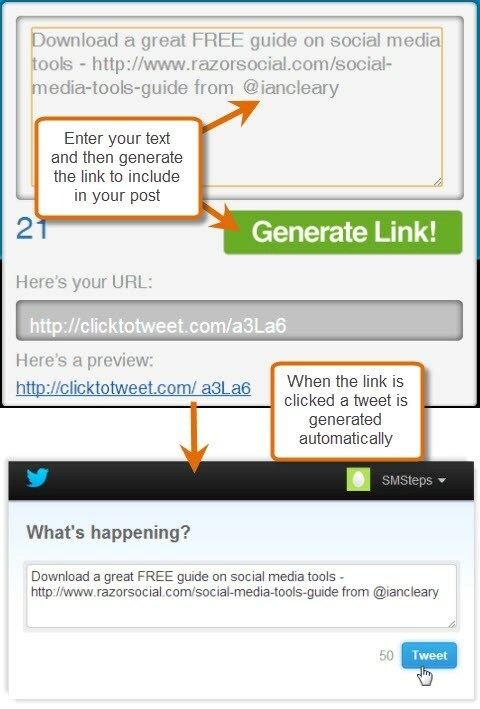 Just enter the text you want to include in the tweet and then include the generated link in your post. Use a Click to Tweet button beside a great quote in a blog post, a promotion you’re running or an event announcement. Inkybee is a blogger outreach tool that helps you find the most relevant blogs in a particular niche, run campaigns to target these blogs and track the results. It determines relevance by counting how many times the keywords you specify appear in the blog’s posts. Once you enter the keywords relevant to your niche (e.g., social media marketing), Inkybee returns a list of blogs that are best suited. You then sort the list based on blogs with the most audience, highest engagement, most posts per week, highest-ranked blog and much more. An example of some of the data that’s returned. Select relevant blogs from the niche, then build a campaign to reach out to the blogs, build relationships and monitor results. 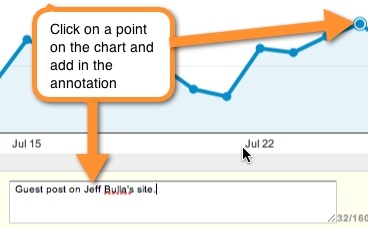 To monitor results, you integrate with Google Analytics and track traffic from the blogs you reached out to. Links to external or internal pages on your blog that don’t work create a bad impression of your website. Broken Link Checker is a free tool that goes through your site and finds any broken links. Identify all broken links on your website. Just enter in your web address and get a list that shows all of the broken links and exactly what page they’re on. If you share your blog post in email or on Twitter, Facebook and other social channels,SqueezeCMM allows you to create custom links in one pass for a variety of channels. 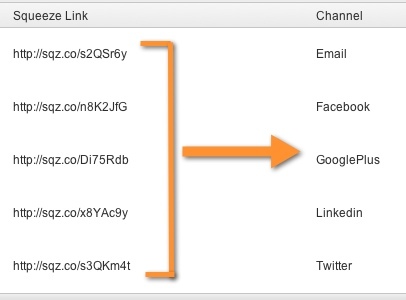 Put in the link address and SqueezeCMM gives you a custom web address for email, Facebook, Google+, LinkedIn and Twitter. When you send out your content, use the relevant link for the channel and see exactly where traffic is generated from as a result of that link. A separate link is created for each channel. Moz (formerly SEOMoz) has their own algorithm that ranks websites and web pages out of 100. The domain authority is the overall rating of the website and the page authority is the rank for any particular page. If you have a high domain authority and page authority, it’s easier to get your blog posts to appear high in search results. Open Site Explorer allows you to check your domain/page authority. There’s a limited free version that allows you to check 3 sites per day, so you can check your site’s authority and the authority of a couple of your competitors. In the example below, you see that Social Media Examiner has a very high domain and page authority (for their home page). Domain and page authority are ranked out of 100—the higher the better! The best way of increasing your domain authority is to get businesses that are in a similar niche with a very high domain authority to link to you. In the example above, you also see Linking Root Domains. 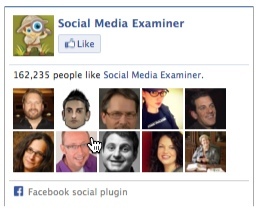 This is the number of unique sites that link to Social Media Examiner. Because it’s so high and a lot of the businesses that link to them are relevant, their domain authority remains high. WordPress SEO Plugin is an excellent plugin to optimize your blog posts for search engines such as Google. You select the keyword(s) you want to focus on within the post and this plugin gives you easy-to-follow guidelines regarding where you need to place these keywords to appear higher in search results. WordPress SEO provides you with clear guidelines on what you need to do to assist in the ranking of your post for particular keywords. When you create a blog post with great images, you may want to encourage visitors to share your images on Pinterest. One way to do this is to install the plugin calledJQuery Pin It Button for Images. When someone hovers over an image, the option to share on Pinterest automatically appears. If your visitors are active on Pinterest, why not give them the option to pin your images on their boards? Flare is a social sharing WordPress plugin that displays a vertical sharing bar alongside your blog post. As the user scrolls, the bar moves with them. You can also choose to have Flare appear horizontally at the top of your blog posts. On a mobile device, the vertical sharing option doesn’t appear; however, the sharing bar appears across the top of the posts, so you still get shares on mobile. The vertical bar for sharing is not available on mobile, but the horizontal bar at the top of your posts is! Flare is visually appealing with useful functions and it works really well for social sharing on desktop and mobile. When someone reads your blog post, you may want to encourage him or her to contact you to book your services. 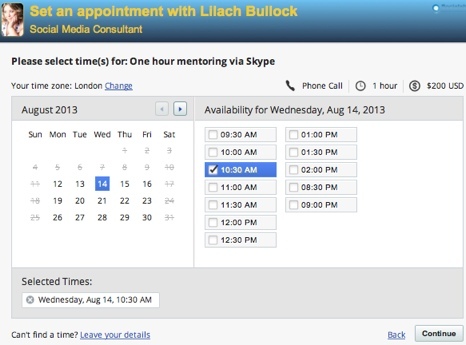 For example, if you are a consultant, you may want to encourage readers to book a time slot with you. vCita is a popout box that appears after a specified interval on your page. 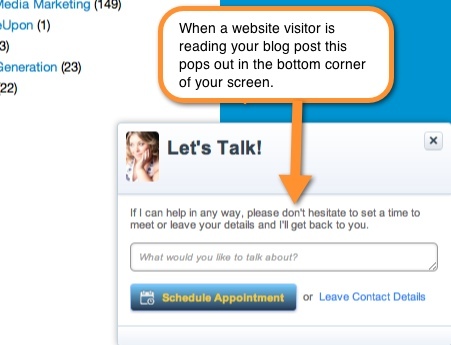 It pops out at the bottom of your blog post to ask your visitors if they want to schedule an appointment. The popout is a great way of attracting attention. They click on the button to make an appointment and pick out an available slot in your schedule. Visitors schedule an appointment based on your available time. After they pick the appointment time, you can even collect payment using PayPal! When you create a new blog post, it makes sense to link to another blog post that has information relevant to your current post. 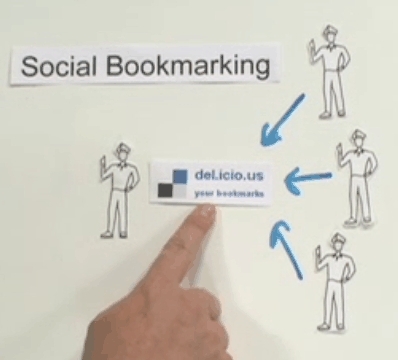 This internal linking between posts is beneficial for your search engine ranking. Google ranks pages that contain relevant links higher than those that don’t. Links from external websites are more beneficial, but it’s still useful to do some internal linking. Make sure to link to some other articles on your website. Consider linking to other published posts when you write a new post, then review existing posts to see where you can introduce more links between them. When you share photos over social media channels, it’s useful to add text to the picture so you have a better chance to grab the attention of someone who sees the picture within their news feed on Facebook, Pinterest or other channels. PicMonkey is a free online photo editor that allows you to add text to your pictures. Easily add text to images within PicMonkey. 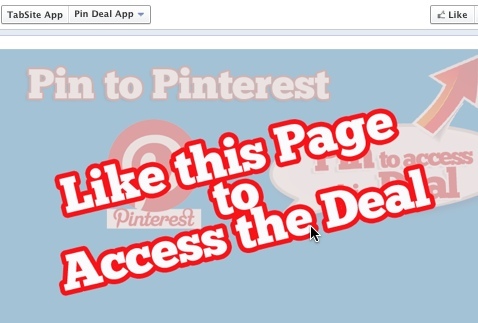 Take a look at Pinterest and Facebook and see how text is used on images to attract attention. Evergreen content doesn’t go out of date. Unlike the latest news, a post on strategy may always be useful. If you’ve written lots of great articles, it’s important to keep promoting them to your audience members who may not have seen them originally or who may have forgotten about them, and to new fans and followers. With SocialOomph, you set up a queue and add your blog posts to that queue.Specify a time interval when a blog post should be taken from that queue and posted on social media channels. 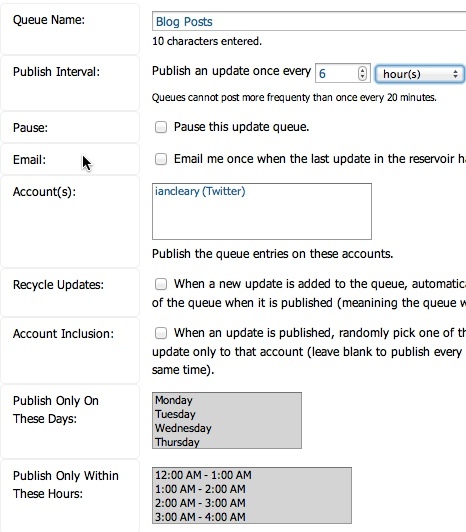 For example, you could put 50 posts in the queue and get SocialOomph to post one item from the queue every day. When all 50 posts have been published, it goes back to the start of the queue and sends each item again. Setting up a queue within SocialOomph is quite straight-forward. If you only have a few blog posts or a few followers, make sure to space out resending your blog posts (e.g., every 2 weeks) so that the same people don’t see the same posts too close together. This isn’t so much of an issue if you have a lot of followers and many blog posts; in fact you may even be able to send out posts every few hours! The search facility within different social media channels isn’t always great. So why don’t you use Google to search them? If any content is made available for Google to index, then it’s searchable. For example, if I type “Razorsocial site:www.linkedin.com” into Google search, I can see if a company has mentioned RazorSocial on their LinkedIn company page. Then I can go to this page and click Like to show my appreciation. This was one of the many results found on LinkedIn. If you want to search for a person within LinkedIn, you’re restricted to results based on whether you are a free or a paid member. However, if you search using Google, you’re not restricted. 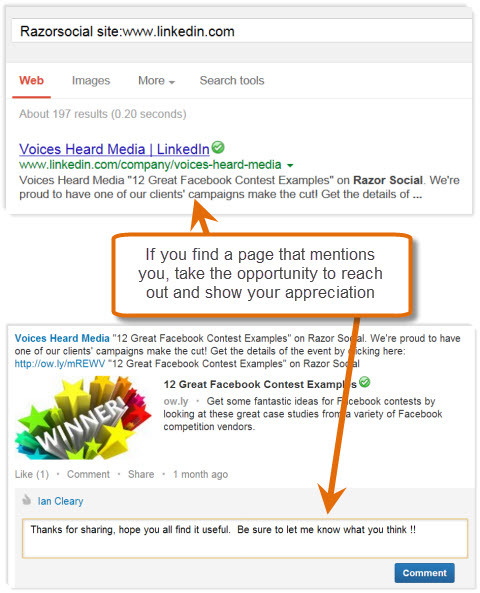 Replace LinkedIn with any other social network to find mentions of your own site. A great blog post title makes a significant difference in the traffic you get and the number of times the post is shared. The Tweak Your Biz Title Generator displays a variety of possible titles to use based on the keywords you enter. A wide variety of post ideas is displayed. SocialCam is a video creation and editing app for iPhone and Android. 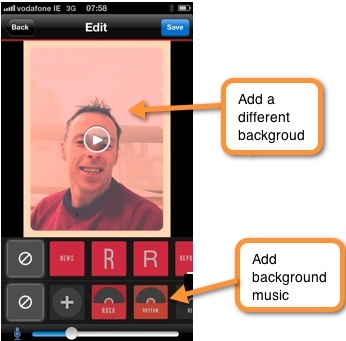 You shoot your video and edit it on the phone to add text, change the background and even add background music. An easy way to take and share videos. You don’t need a lot of time or money to add more personality to your social media marketing using video when there are apps like SocialCam. Lists are extremely popular in blog posts, but they’re static and can’t evolve. 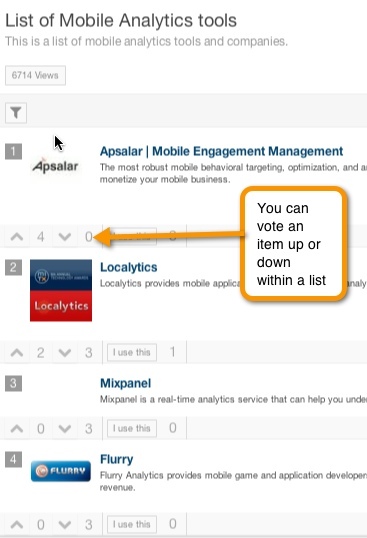 List.lyallows you to create a list that embeds within your blog post and lets visitors add items to the list, then vote and comment on the items. When you create your list, it’s also hosted and viewable on the List.ly website, where you can brand your list and add a link back to your website so that it becomes an additional source of traffic to your post. Your list can be on List.ly, embedded on your website or both. A hashtag is a way of grouping a conversation around a particular topic. They are particularly popular on Twitter, but have found their way into other platforms like Google+ and Facebook. View all of the conversations happening around a particular hashtag. If you want to research conversations about something important to you,Tagboard allows you to view conversations based around a hashtag across a variety of social media platforms. 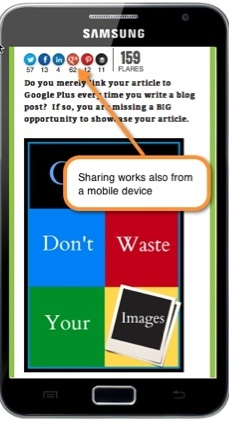 When someone is on your blog, a good way to attract attention is a popup. A less intrusive way to get attention is to use Hellobar to display your call to action. Hellobar is a thin bar that appears across the top of your page after a time that you specify. You configure the text, the color and the call to action and have it up and running in a couple of minutes. In the example below, the color of the bar contrasts with the color in the banner so it stands out on the page. Having a contrasting color really makes Hellobar stand out. If you see sudden spikes or dips in traffic on Google Analytics, you may not remember why these occurred in 3 or 6 months. You may have gotten a great writeup in a newspaper, run an advertisement campaign or completed a guest post that was popular. The best way to track this is to add annotations to these spikes or dips within Google Analytics when they happen. Annotations are easy to add and well worth doing. Use them as reminders of precipitating events when you review historical analytics in the future. When readers subscribe to your blog for email updates, consider sending them to a thank-you page that holds the Facebook widget, which allows them to become a fan of your Facebook page. Because they just made a commitment to become a subscriber, it’s a very easy decision to become a fan too. You should expect up to 25% conversion rate. Subscribers become fans by clicking the Like button on the page. To get the code for the Like box for your page, visit Facebook. A Twitter chat lets a group of people chat about a certain topic on Twitter based around a hashtag at a specified time. 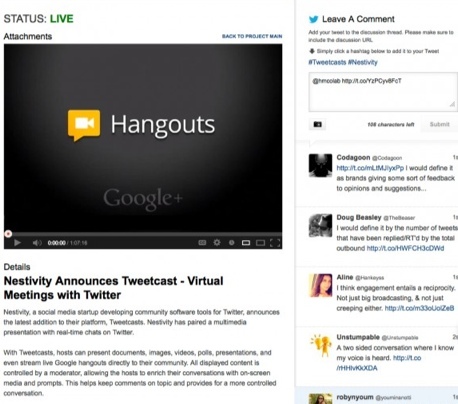 A Tweetcast is a more engaging Twitter chat hosted on Nestivity. During a Tweetcast, you can present documents, images, videos, polls, presentations and Google+ hangouts all within the same chat. Nestivity makes Twitter chat more interactive and engaging. 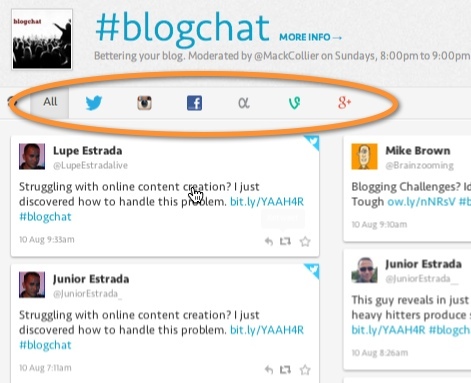 This makes your Tweet chat more interactive and interesting. Google Analytics is a great tool to monitor the performance of your blog, but you may not look at it regularly enough. One way to get around this is to set up a weekly report for delivery to you via email. Easily set up weekly/daily reports. A weekly report ensures that you review your analytics on a regular basis so you can stay aware of major shifts in traffic. A feature box is an image with a form that appears across the full width of your page. It’s normally used to register email subscribers and I originally came across it on Derek Halpern’s website Social Triggers. With my current feature box, 8.2% of all visitors to the page with the feature box on it subscribe to my email list! This is just part of the feature box. The full box spans the width of the page. How are you building your email subscribers? Add a feature box to increase subscriptions. Unroll.me combines any subscriptions you have—newsletters, LinkedIn groups, Twitter accounts, etc.—into one email to reduce clutter in your inbox. Set up Unroll.me and view all of your subscriptions in one place andunsubscribe to any of them with the touch of a button. Easily unsubscribe to your newsletter subscriptions. You’ll easily see which subscriptions don’t add any value, so you have more time to read the subscriptions with content that matters. You should have some goals for what you want to achieve with your blog and it’s useful to track your achievement of these goals through Google Analytics. 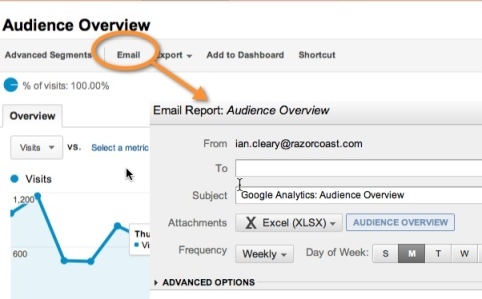 If you track email subscribers, send them to a thank-you page after they subscribe.Set up a Google Analytics goal, which is achieved each time someone reaches the thank-you page. Now you can easily see what percentage of visitors convert to subscribers. Brook sends a daily email summarizing the most popular tweets sent or shared by a group of people you specify. Set up a list of key influencers within your industry, competitors or strategic partners tostay informed of trending articles and use the email as a source of content to share with your own followers. View popular content from people you track. If you want to grow your following quickly on Twitter, the best way is to follow more people who are relevant to your business. 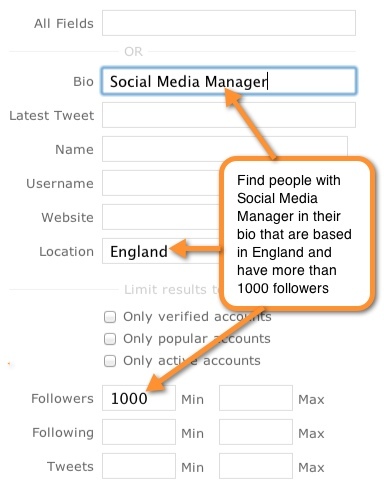 ManageFlitter provides some free functionality that allows you to search through Twitter profiles and find people who meet specific criteria that match your target. The filtering options on ManageFlitter are very good. Use ManageFlitter daily to build a following of people who are interested in the service or products you provide. Recently, Google retired their Keyword tool and replaced it with the Google Keyword Planner. To use the Google’s Keyword Planner, you don’t need to run any advertisements on Google using Adwords but you do need to register for a Google Adwords account. 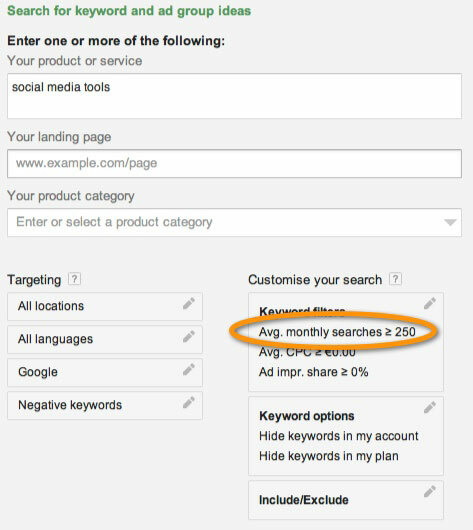 One useful feature of the Google Keyword Planner is the ability to set the minimum search volume for keyword research. For example, if you research the keywords ‘Social Media Tools’ and similar keywords, you can specify a minimum search volume. In the example below, Google filters results to show you keywords that get an average of at least 250 searches per month. Research keywords and filter the results. LeadPlayer allows you to include an email subscription form or a call to action within your video. The Subscribe option appears within the video. Use it to display a free introduction for your video and then show a subscription form that must be completed to reveal the remainder of the video, or include a clear call to action that generates clicks to your sales page. You may already include calls to action within your blog post, so why not include them within a video? Social Crawlytics crawls through any website and displays a report to show which posts get the most shares, and on which social networks those shares occur. Social Crawlytics is a very useful research tool. 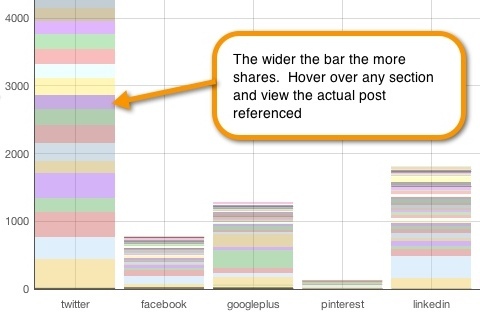 This report shows that content from this site is shared most often on Twitter. Each of the colored areas indicates a blog post and if you hover over any area, you see the name of the blog post and the number of shares it’s received. This is a great research tool to find the most/least popular content on a competitor’s blog. If you find really popular content from a competitor, it’s likely that similar content will be popular for you. If you come across a really nice WordPress site and you want to find the theme, just drop the URL into WordPress Theme Detector. 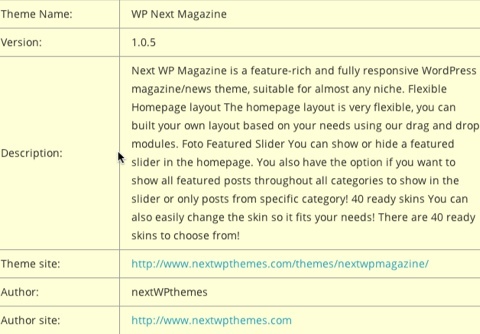 WordPress Theme Detector shows you details of the theme the website is based on. You get a short report that shows information about the theme and a few of the WordPress plugins used on the site. This information you see is freely available if you look at the source of the page, but it’s much easier to read it using this tool. If you use advertisements to build fans on your Facebook page, don’t direct people to your timeline; direct them to a landing page that convinces them to become a fan. Directing people to a landing page increases your conversion significantly. Tabsite allows you to create custom landing pages, promotions and competitions within Facebook that improve your conversion and ROI. Buffer allows you to easily share content you find across the web. Click on a button in your browser and content is automatically added to your queue for delivery to your social networks based on times you specify. When you share content through Buffer, it keeps track of the interaction on the content so you see how much engagement you get based on both the content and the time you post it. 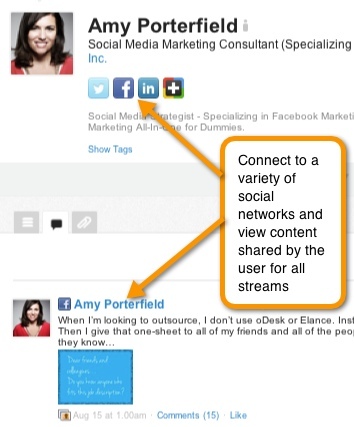 This is an example of a link shared on LinkedIn using Buffer. 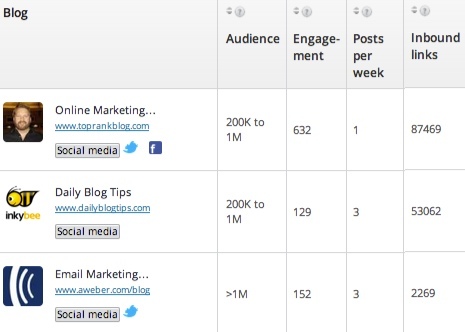 Investigate how your content performs across social media channels. Is there any particular content that does better on one channel rather than the other? Are there any particular times that work best for you? Adjust your content and delivery according to what you learn. A great way to build fans and promote a contest on Facebook is to encourage entrants to share the contest with friends by offering incentives. 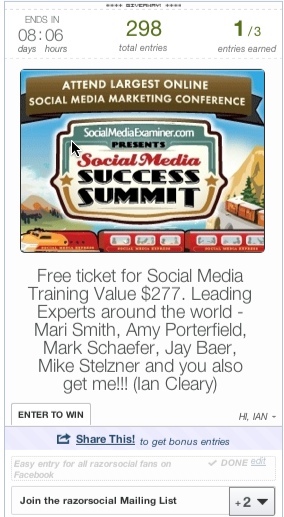 The following contest—run using Rafflecopter—offered a free ticket to the Social Media Success Summit. You had to be a fan to enter the contest, but you could enter more than once by becoming an email subscriber and by sharing the contest with your friends. Providing incentives to share helps spread your contest and grows your fans. Extend the visibility of your next Facebook contest with a good incentive that encourages people to share it with their friends. If a website visitor makes it to the end of your blog post, that’s a good place to put acall to action to encourage them to subscribe to your blog posts or purchase your product or service. 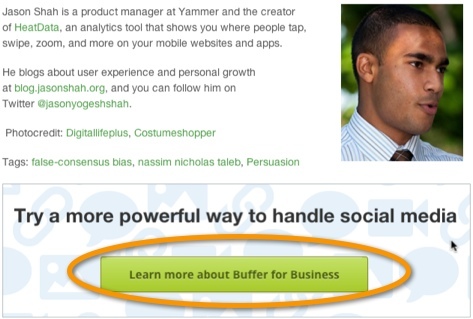 The Buffer team includes a very clear call to action at the end of their post. What goal can you achieve by including a call to action at the end of your blog post? We already mentioned using SocialCam for basic editing, but if you want to do advanced editing, Camtasia and ScreenFlow are powerful tools that both provide excellent editing facilities and neither is difficult to use. Easily cut or add pieces of video, drop in opening slides, add text and much more to help you create professional webinars or tutorials. 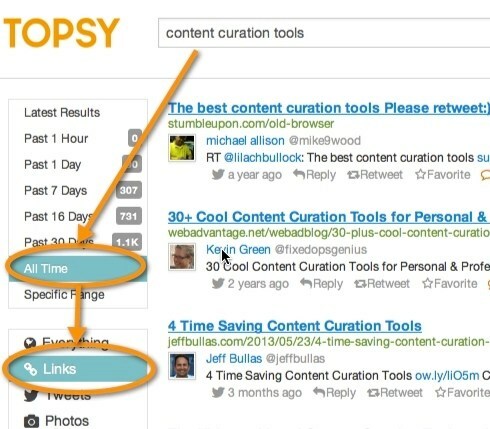 Topsy is a social media search engine that searches for content based on a keyword and filters the results based on the content that has the most links. Use the results to find inspiration for types of content you can create and distribute on your own site and networks. 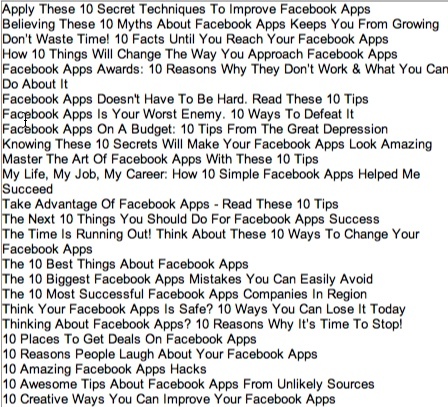 You want to see the most popular content based on links for any time (i.e., not just for the last 30 days). Nimble is a social customer relationship manager that lets you build relationships with influencers, customers or potential customers through social media. 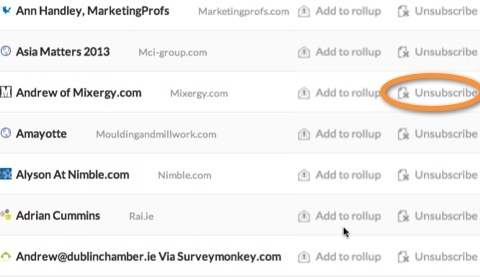 For example, create a list of key influencers in your industry through Twitter, then add this list to Nimble. Add their profiles on LinkedIn, Facebook or Google+ andtrack all of the interactions you have with them, monitor their activity and even respond to them through Nimble. Track and monitor all interactions within Nimble. Building relationships requires ongoing interaction and Nimble helps you nurture and build those relationships. If you want someone to leave a response or ask a question for your podcast,SpeakPipe lets your website visitors leave a voice message with the click of a button. Let visitors record a message! 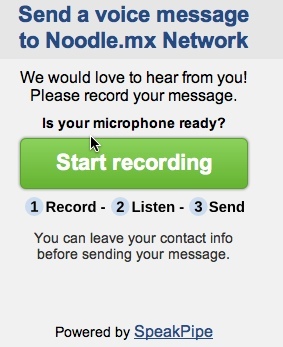 Now you can play this voice message back on your podcast and answer their question directly! If you want to create content that does well in Google search, you may want to see what keywords send your competitor lots of traffic. With SEMrush, you type in the website address of a competitor and it shows you the top 10 performing keywords for their site. Target keywords that your competitor gets a lot of traffic with. Use what you learn to incorporate the same keywords into your own content. Use these tips and tools to empower and inspire you to improve your social media marketing strategy. Start small, make adjustments and then follow a strategy that works best for your business. What do you think? Are you using any of these tips or tools? What’s worked well for you? What would you add? Leave your questions and comments in the box below. 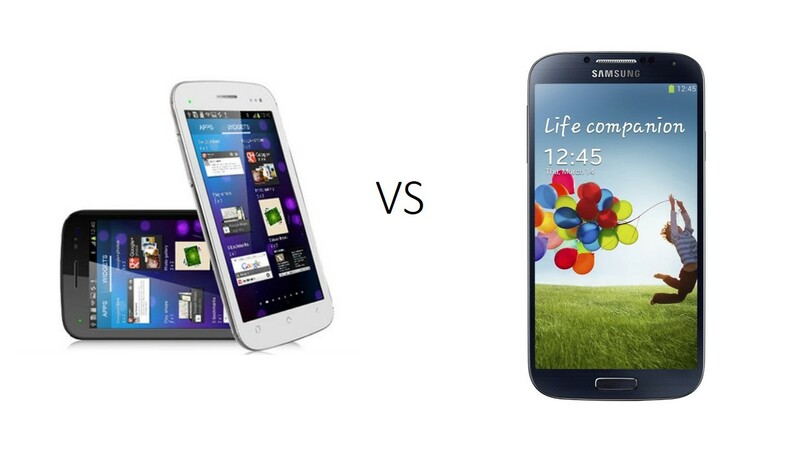 Here is an comparison of the Galaxy S4 and expected specs of the Canvas 4.